I came on board Tim Arnold’s ‘What Love Would Want’ project completely by accident. I’d never met Tim, but he turned up at a party in my studio in Toronto and performed the song for the first time during Canadian Music Week in 2017. He instantly got the attention of everyone in the room and we all walked away singing the song. Inspired by both the He For She women’s equality initiative and numerous LGBTQ campaigns, we knew we were part of something really special, and that was even before we’d seen the video he’d made for the song. Less than a month later, he called me up saying he’d been asked by Amnesty International to sing the song at The Russian Embassy in a London protest, as reports surfaced that there were gay concentration camps in Chechnya and the government had said "gay people don’t exist in Chechnya". Tim joined Sir Ian McKellan and Peter Tatchell in a show of solidarity where he sang the song outside the embassy. Next, we did The Isle of Wight Festival together with Amnesty UK. Love Is A Human Right banners were everywhere at the Isle of Wight Festival in 2017 and showed Tim’s commitment to the many causes he addressed in the song. I recorded the performance for the video and it wasn’t long after that, the song got it’s first spin on BBC 6 Music. My introduction to the project was as a musician and producer. But Tim and photographer Andy Fallon’s vision was reaching for something more than just a song and a music video. The first video was created in a tiny basement in Soho, London. Tim would meet and film each couple who had volunteered to take part, then they would walk around the corner of the screen and Andy would shoot their portrait. There were gay couples, straight couples, lesbian, transgender and disabled couples. It was a true portrait of love. Painted by the subjects themselves, just by appearing. The end result was so moving that I invited Tim and Andy to make another video in Toronto with Canadian couples, I translated the song into French and coached Tim for his recording of the vocal on the Canadian version of the song. After this, the song became a live arts installation project, open to the public, who could see each couple as they were filmed and witness the atmosphere of raw emotion that until then, only we had been privy to. 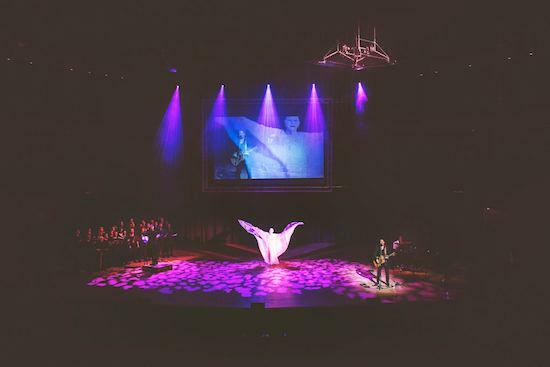 The concept was so exciting, and thanks to The Bridgewater Hall, we were suddenly moving the project from Toronto back to the UK again, but this time, in Manchester. And then Tim told me that Lindsay Kemp would be joining the project. Tim had already collaborated with Lindsay in 2017 on his single ‘Change’ with Lindsay interpreting the song through a procession of facial expressions. It was utterly mesmerising and a unique way to communicate song lyrics. 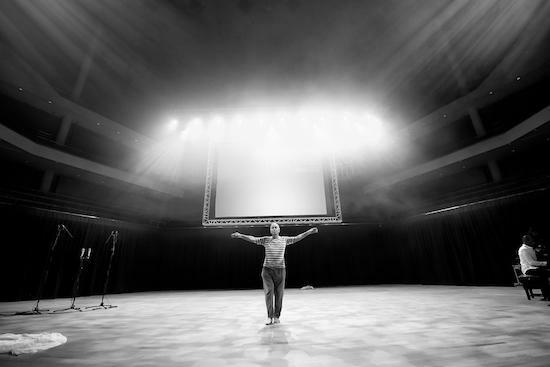 And that’s exactly what we worked to achieve with What Love Would Want at The Bridgewater Hall in Manchester. After 2 days of camera rehearsals with Lindsay’s dance partner, prima ballerina Daniela Maccari, the resulting 6-minute music video was filmed live across 10 hours, on the Sunday of the performance. We were all on our feet for most of the day, but Tim was on stage for the full 10 hours with just a 30min costume change before going back on stage with The Manchester Lesbian and Gay Chorus and pianist Emmanuel Vass. There were about 100 people all working on the production for one day just to create a single music video, starring Lindsay Kemp. His performance was breathtaking and none of us thought for a second that it would be his swan song. As Tim brought Kate Bush’s flowers on stage for Lindsay, everyone could tell that Lindsay’s return to the British stage was a pivotal moment for him and perhaps something he had waited for. For a long time. In fact, we’d already begun to talk with Lindsay about where we would do it next. He was excited to take it on tour. During the day of the main event, Tim and Andy met and then filmed 18 couples. That was a performance in itself. I was recording and monitoring multiple microphones that constantly fed both Tim, Andy and all the couples talking to each other about love into my ears. It was an insane soundscape to have running through my headphones for 7 hours, but equally inspiring and very moving when couples became emotional or cried. We were recording and filming love as members of the public would walk into the hall and walk across the stage to watch the project come to life. As Katie Pucrick remarked in the Q & A after the show, this was the kind of event that John and Yoko would have put on in the 60’s. It was a happening. By the end of that first part of the day, I had no idea how Tim was going to transform from director to singer/performer within half an hour, but he did it just as if it was any other gig. And I think I know why: he was about to perform with Lindsay Kemp on stage for the first time. Tim’s journey to finally working with Lindsay took 30 years. He read about Lindsay as a kid and was inspired. 30 years later, when Tim founded the Save Soho campaign, he turned up on Lindsay’s radar. They became close friends with their love of Soho as a bond (they both lived on the same street in Soho, albeit 30 years apart). Lindsay had been a fan of Tim’s albums Secrets of Soho and The Soho Hobo and it was the area’s famous melting pot of inclusivity and freedom of expression that had moulded both of their careers. And that common ground fed in to the message of this collaboration. They both understood that it was a statement about the danger of labels:He for She? He for He? She for She? The lyrics’ nursery rhyme simplicity has been misconstrued by many campaign groups who simply missed the point. The song isn’t a call to arms for marginalised groups. It’s an exposé of the danger of labels. Tim – biracial and the son of a gay woman who fought for women’s rights and gay liberation in the 70’s (Polly Perkins) was singing from lifelong experiences. He wrote the song from the point of view of his eight-year old self – a child who did not identify his parents because of their sexual preference. He just cared about the love he felt from them. Like all children do. In this age of diversicrats, the lyric ‘ask what love would want’ is the only question that truly matters. Lindsay Kemp understood exactly what Tim was saying, and knew how to illustrate it visually in the song. When Tim finished writing the song back in 2017, the first person he sent it to was Stephen Fry, who subsequently ended up in the video. He explained to Fry that, as naïve as it sounded, he dreamed that in the future, all churches would be inclusive, and that this could be a hymn that might be sung in those churches. Ironically, with the sad passing of Lindsay only months after completing the Manchester show of What Love Would Want, Tim sang the song in the famous non-Catholic church in Rome at Lindsay’s funeral, full cycling a message for a more inclusive future. Lindsay broke new ground at the end of his life as he had done with his famous production Flowers in the 70’s – the show that inspired Kate Bush and many others. But his final dance, embodying the spirit of love in What Love Would Want is a projection for an ideal of the future, a testament to Lindsay’s never-ending urge to pioneer new ideas through his art. He was a visionary. It remains a privilege to have been part of the project and to spend that time with Lindsay, Tim, Andy and the whole cast. What Love Would Want is a calling for Tim and for all of us who have been fortunate enough to be involved, and as long as couples and communities are proud to show their love to the rest of the world, the What Love Would Want project will continue to document that in music, film, photography, performance and dance. 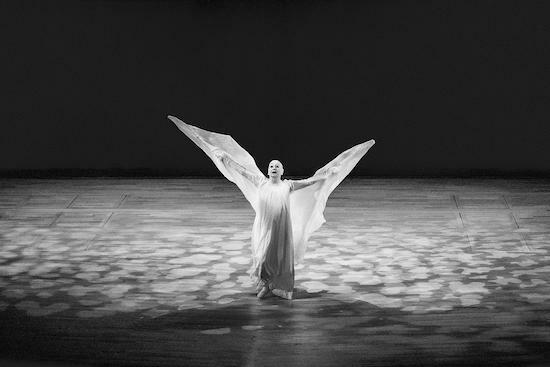 Lindsay Kemp’s legacy will forever be etched into the history books with his era defining theatrical productions, as well as the power of his life transforming classes that endure through the work of his devoted students. But his final theatrical project in the UK was completed in this video, with a pure, genderless, ageless performance of love and light. What Love Would Want is a bold message – begun by Tim, but completed by Lindsay. If we begin to understand the message, we too, like Lindsay, may all begin to understand What Love Would Want.